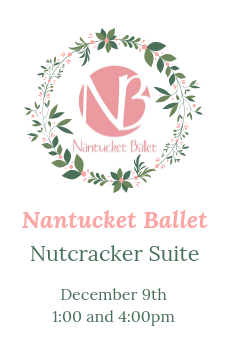 Get into the holiday spirit with The Nutcracker Suite presented by the Nantucket Ballet. Share the magic and beauty of this beloved holiday classic with your loved ones! The Nutcracker Suite presented by the Nantucket Ballet is a shorter, family-friendly version of the beloved holiday classic. Join Clara as she encounters dancing snowflakes, candies, and life sized dolls. Whether this is the first Nutcracker or your 50th it is sure to captivate. Let the music of Tchaikovsky paired with dancers of all ages transport your family into the magical land of the sweets.